The ancestors observed as the drums and song filled the forest around them. 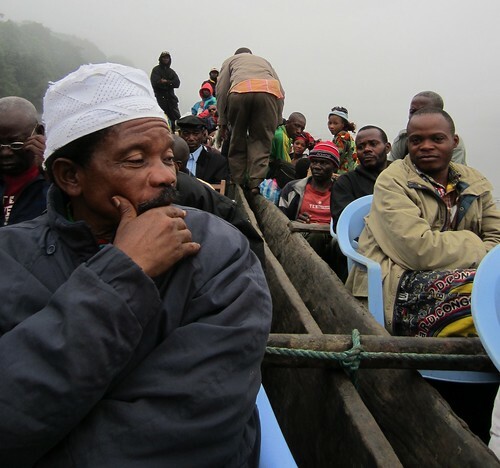 The chiefs in the northern province of Orientale, like those in the south, insist that the ancestors be consulted before a Park is created on their lands. 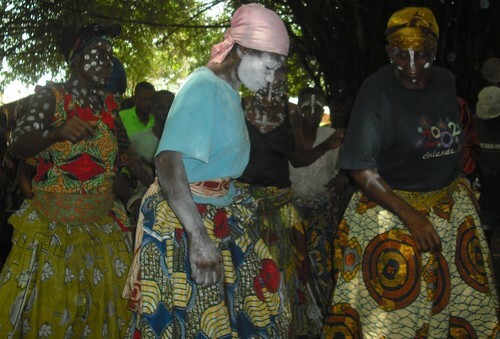 A “tambiko” must bring together all the traditional authorities. 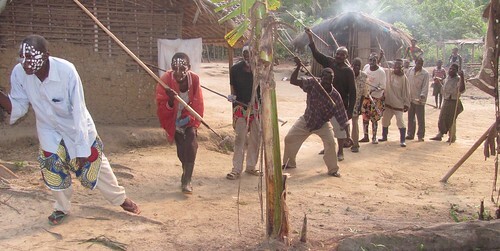 The Mbole ethnic group held the first tambiko in August. 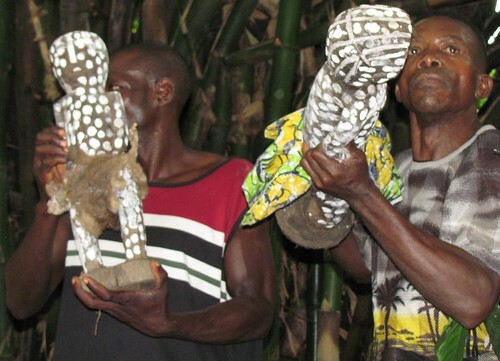 The village they indicated was the most remote possible, a tiny outlier that had become a hide out for elephant poachers and bushmeat buyers. Probably the best place for the ceremony. The chiefs would be amongst the people that needed most to understand what a park meant. But getting everyone there would be a project. 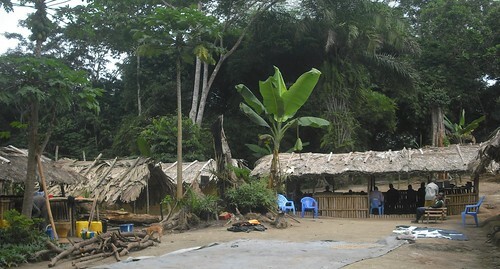 Our TL2 project has had a base in Obenge since 2007. This is our compound and if you look carefully you can see our dog. We started in Kisangani on August 11th. We were 22 people on 11 motorbikes, included two people from the governor’s cabinet, a representative of the department of the environment, the provincial head-warden for parks, the army, a chief from another territory to be a witness, and someone from the department of land tenure. It was two days to get to Opala. We stopped for minor repairs in the mission village of Yaleko. We crossed three major rivers the first day and slept on the banks of Lomami to arrive at the capital of the territory – Opala, a town with no telephone coverage sitting in a huge bend of the Lomami River. It takes a full hour in an empty dugout with a 25 horse power motor to go from one end of Opala, around on the Lomami, to the other end. It can be walked in less than 20 minutes. A welcome evening to relax in Opala after two days on motorbike. The Parks head-warden for Orientale Province, Paulin, is in TL2 shirt, and joking with two members of the governor’s cabinet. After a day organizing food and passengers we took off on the 14th with 54 people in two dugouts lashed together. 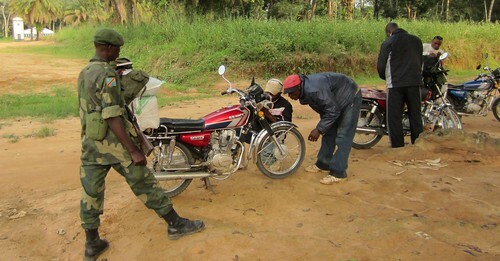 Along with the motorbike caravan from Kisangani, there were the Mbole chiefs from the clans of the whole region, along with elders, and the top administration of Opala. The dugout trip was two days, upstream with three motors pushing us. All we had to eat was cold fried pig meat and shikwong (a sort of hard manioc paste). I will be perfectly pleased if I am spared another such meal for a good few months. We had a ten-person singing group in the back of the dugouts. At one pitstop (three per day) they lined up dancing and singing along the bank’s ridge — they pulled us up one by one to go disappear for a few minutes in the trees. Taking off in the early morning from Opala. The territorial administrator in front with white kofia (cap). We camped just north of the future park arriving in the outlier village of Obenge on the 15th early afternoon. John was already at our TL2 compound in Obenge having come up from the south in another dugout and having brought two chiefs from the Province of Maniema as witnesses. Early the morning of the 16th men of the Balolo clan “invaded” our compound : the ceremony would soon begin. The tambiko started on the 16th. What we saw was amazing, what happened was unexpected…. A goat was slaughtered. 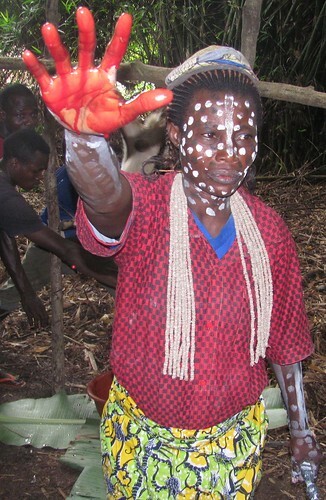 The woman chief of Obenge announced that the ceremony was beginning holding high her bloodied hand. Drums. Song. Soon everyone was up dancing, including us…. The women, including MamaTerese, and the woman-chief of the Balolo were asked to leave. 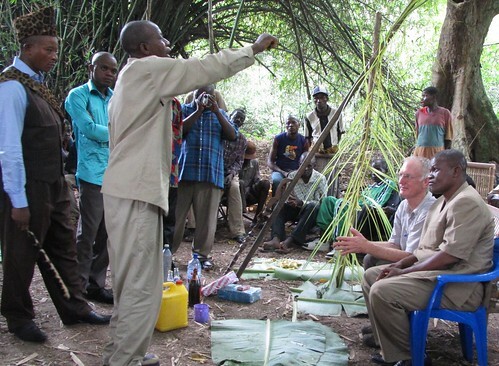 I continued to sit with the men in a large circle as Jean-Marie Ngandi, chief of the Balinga Lindja selected one by one individuals to move into a smaller circle around palm branches set up as a symbolic gateway to the forest. Banana leaves had been laid out around the palm gateway. As the clan elders were selected, each stood up, left the big circle and, taking their chairs, moved near one of the banana leaves by the palm gateway. 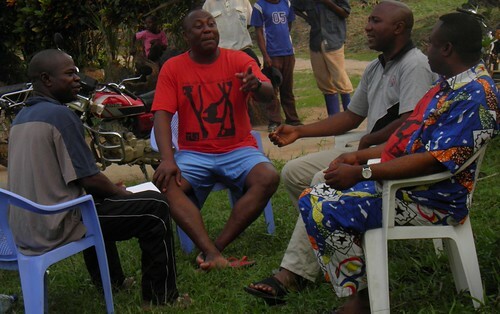 Finally Jean Marie asked the visiting chiefs from Maniema to join and he moved to the palm gateway himself. Chief Jean-Marie Ngandi of the Balinga Lindja. At this point just the visitors and witnesses remained in the original circle: the officials from the territorial and provincial administration, David (a student) and myself. Jean Marie then stood and approached me and asked that I join him with the clan members at the palm gateway. Okangola, an Mbole university student, accompanied me as my guide (and interpreter). We joined the smaller circle. My chair, and that of Okangola were set up beside the palm gateway. The chiefs and elders encircle John at the gateway to the forest. After we were settled, Jean Marie Ngandi gave a short speech in which he made it clear the establishment of a park in the Mbole forest was not selling the forest. Following that he called on each clan representatives to come forward using his leopard-skin covered scepter to direct them to stand next to me at the palm gate. Each clan leader took strips of banana leaf dipped them in a basin of water in which we had washed our hands first. Each person then invoked the ancestors standing in front of me and at the end hitting me on the head with the dripping leaves. Finally, each ended by “kutema mate”, or spitting on the leaves as they tossed them under the palm gate. A chief haranguing John before slapping him on the head with the leaves. We all then ate a symbolic meal of meat from the goat slaughtered at the beginning of the ceremony and lituma (pounded bananas). The remains of the meal were carefully cleared up. 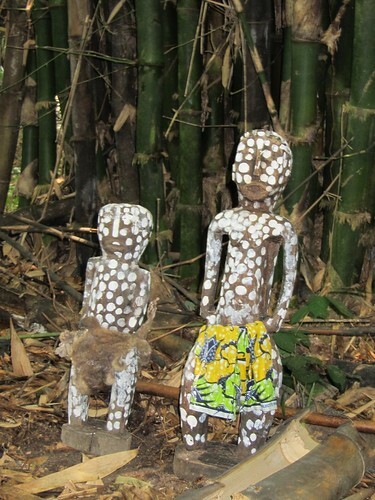 Okangola explained to me that they were placed as an offering to the ancestors. I was later told, with some awe by an old man, that John had become Wilangi — a keeper of customs able to deal with the invisible world, intercede with ancestors. What does this mean? We don’t know — not yet — but I still hear the drums, and the song. A Park for Bonobos? Do the Ancestors Want It? This entry was written by Terese Hart, posted on 2011-09-08 at 11:05 pm, filed under About the project, Indigenous peoples. Bookmark the permalink. Follow any comments here with the RSS feed for this post. Post a comment or leave a trackback: Trackback URL. Interresting post, best regard from Belgium. It’s been a very long while. Please contact me if time permits. Send John my regards as well please. Would like to open dialogue with you regarding what your conservation projects need right now as far as funding is concerned.